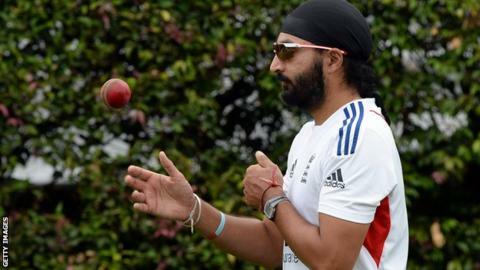 Former England spin bowler Monty Panesar has been named in the Essex team for the first time since April. Head coach Paul Grayson said last month that Panesar was unavailable for selection because of off-field "issues" and was being helped by the Professional Cricketers' Association. The 33-year-old was, however, selected for the Championship game with Surrey at Colchester which started on Friday. He has taken 699 first-class wickets in his career at an average of 30.77. Left-arm spinner Panesar's only appearances for Essex since April have been four outings for the second XI, the most recent in a limited-overs fixtures against Middlesex on 8 July - though he has also played for his old club side Luton Town and Indians CC. His recall to the first team comes after fellow spinner Ravi Patel was recalled by Middlesex from his loan spell at Essex. The county are also without the injured Ryan ten Doeschate (knee), Graham Napier (calf), Jesse Ryder (back) and David Masters (niggle). Panesar was not involved at the outset at Castle Park as Essex won the toss and decided to bat first. He played 50 Tests for England between 2006 and 2013, taking 167 wickets. Listen to BBC commentary from Colchester - and all the other County Championship games.